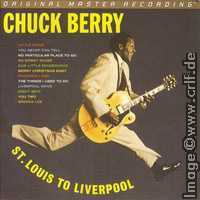 Re-issues of Chuck Berry's old hits and albums exist by the hundreds or even thousands. No serious collector tries to get them all. 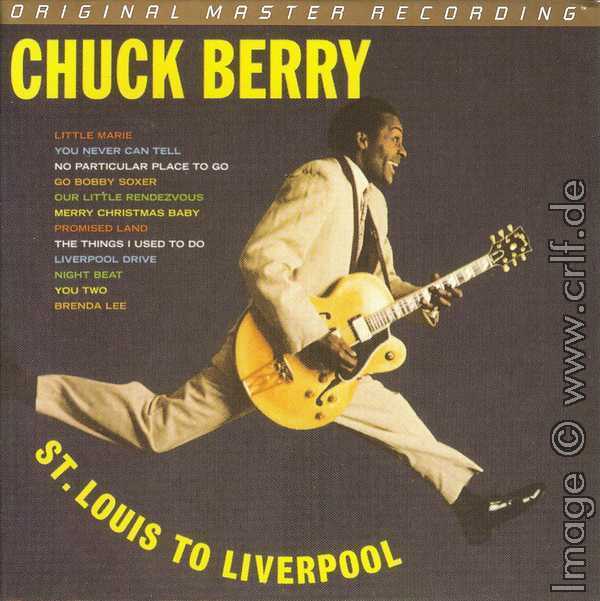 Even Morten Reff, author of the ultimate book on Chuck Berry records "The Chuck Berry International Directory", tells me he lost track of all the cheap re-issues released month after month. And with the Hip-O-Select CD boxes claiming to contain Chuck Berry's complete recorded output for Chess, there's another reason gone to even check out re-releases. What could be found of interest if every recording worth listening to has been included in the box sets? Due to this, all collectors I know (including me) ignored this re-issue when it was released in June 2008, even though it says it's in Audiophile quality (i.e. expensive) and remastered from original tapes. Strangely enough, but here's an alt. take of "Anthony Boy" which has never been out before. The Mobile Fidelity CD is a pairing of two classic Chess albums, Chess LP-1435 from 1959 and Chess LPS-1488 from 1964. Front cover as on the original ‘St.Louis To Liverpool’ LP. However, they brag about the sound quality (which is quite goode actually) and how superior Mobile Fidelity Sound Lab is to the audiophile entertainment software and significant contributions to the world of high-end audio software using only original master recordings, and on and on they go. And although it is a nice digipak issue looking very professional and the CD (Ultradisc II) coming in 24-karat gold(?) and being a special limited edition (10.000, mine is #01668). BUT, and here's the news folks, how come they got hold of an alternate version of 'Anthony Boy' ??? Anyway it's here and therefore, you all need this issue! It's a little different, the choir is not so loud in its Go's.. and the guitar solo is a little staccato. How did it come? I'm sure they asked Universal for the original master tapes and by accident got a wrong one. I'm sure no one noticed because if anybody would have known, there would have been at least a minor note somewhere on cover or booklet. Those who know say that while the hit version of "Anthony Boy" is take 9, this recording here is an earlier take 6 from the same session. The Mobile Fidelity CD is available from many Internet shops and priced between $30 and $50 plus shipping. Quite expensive for yet another re-issue, but in order to have a complete collection, you need to buy one. Click here for some links to reasonable offers.